Further Comments: After a Sunday service, several members of the congregation asked the Reverend who the new curate who they had seen standing in the sanctuary. In fact, the old curate had left, but had yet to be replaced, leading several to speculate they had seen a ghost. Further Comments: This church was said to be home to a phantom monk or lay friar and was spotted a couple of times during the mid twentieth century. Further Comments: These robed figures float above the ground, 'walking' where the path was once much higher. Further Comments: A witness reported seeing a well dressed man creeping along the back of the church. This figure walked through a wall, leaving a thin veil of smoke in his wake. A few years prior to this, another entity had been seen around the same place, though the witness said the ghost had worn tweed clothing. Further Comments: Several locals reported seeing a phantom woman with ginger hair, dressed in white or grey, in the early hours of the morning. It was said to have followed people as they left the area, while one other witness observed it reading headstones. Further Comments: Echoing footfalls have been reported around the church and a large strange animal seen that vanished when approached. Further Comments: Two visitors to the churchyard were alarmed by the appearance of three hooded figures floating down the path reasonably quickly. The figures possessed a faint glow, and there was also a pale hue under the hoods where their faces should have been. The witnesses ran out of the churchyard, but stayed outside the grounds for several minutes to see whether the figures would reappear. They did not. Further Comments: The graveyard was once said to be haunted by a person hanged on the site. Date / Time: Mid twentieth century? Said to appear at dusk. Further Comments: This phantom figure moves at speed, and is said to have a bag thrown over one shoulder. 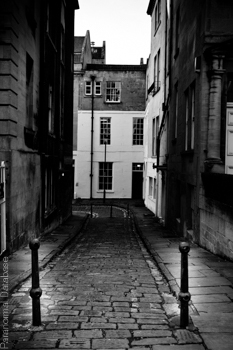 Further Comments: Walking home through the churchyard, a witness heard movement behind them. Turning around, they watched as a misty green shape fall to the ground and vanish with a thud. Further Comments: The church once stood at Church Piece until someone (Devil or angel) moved the building to where it now stands. As a side note, a Roman structure was found at Church Piece, and parts of a Roman altar found in the church walls. Further Comments: A witness recalled how he stood outside the vestry door, listening to two men talking about money. When he knocked and walked in, the conversation stopped and the room was empty. Further Comments: A woman wearing in seventeenth century dress is said to haunt this churchyard. Further Comments: During a church service in 1577, a large black dog burst in and created havoc. 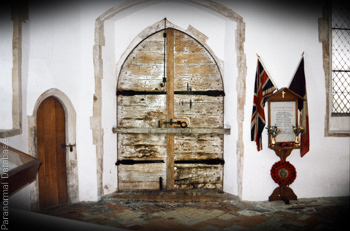 Blackened scorch marks said to be caused by the creature still exist today on the church door. Many years later, in 1973, a man working in the marshes near the church reporting hearing a panting dog standing besides him, though nothing could be seen.